The name – the Republic of Northern Central Africa – and a design for a national flag, are circulating by mobile phone in the dusty town of Bambari, which divides the CAR’s largely Christian south from a northern region now controlled by the mostly Muslim Seleka rebels, according toReuters. But the United Nations, the African Union, the former colonial power, France, and many analysts insist that this is neither likely nor desirable. The call for partition echoes numerous secessionist movements across Africa, where arbitrary borders drawn by colonial mapmakers disregarded and cut across ethnic boundaries. South Sudan, the CAR’s neighbour, gained independence from Sudan in 2011 – but is now embroiled in a civil war of its own. 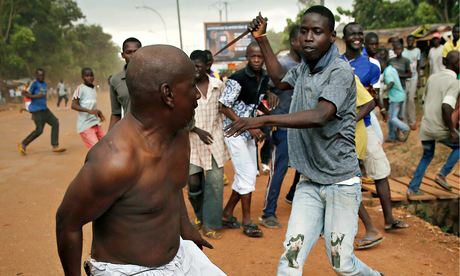 Militias known as the “anti-balaka” have driven tens of thousands of Muslims from the south, destroying mosques and virtually wiping out the Muslim population of Bangui. The UN high commissioner for refugees, António Guterres, has said the country faces “massive ethnic-religious cleansing“, while Amnesty International has warned of a “Muslim exodus of historic proportions”. Indeed, an independent north would play into the hands of neighbouring Chad and Sudan, whose mercenaries played a major part in a coup in March last year, sparking a backlash along religious lines that forced the Seleka to cede power in January. This is just one reason why partition is implacably opposed by the CAR’s interim president, Catherine Samba-Panza. The UN secretary general, Ban Ki-Moon, has also warned of its dangers and the French president, François Hollande, has vowed to prevent it. Posted on 27th April 2014 by newsafrica. This entry was posted in Africa, African Security, African Union, Anti-Balaka, Central African Republic, Christainity, France, Headlines, Islam, Religion, United Nations and tagged 2012–2013 Central African Republic conflict, Bambari, Bangui, Central African Republic, Muslim, South Sudan, Sudan, United Nations. Bookmark the permalink.